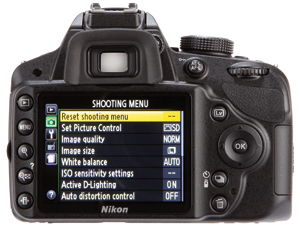 For an entry-level DSLR, the LCD screen has a solid specification. It is a 3in LCD type with 921,000 dots, which is a big improvement over the 230,000-dot screen of the D3100, although it is not articulated like that of the D5100. The screen is bright enough for live view, image playback and to navigate the menu, but users may struggle to see it clearly in bright, direct sunlight. The viewfinder is a pentamirror type with a 95% field of view and 0.8x magnification, which is the same as on the D3100. The camera is very capable in its video recording: full HD (1080p) capture is possible in H.264 format at 30fps, or 720p at 60fps. Continuous AF is available via the contrast-detection system, which is very handy for keeping up with moving subjects. A mini HDMI output provides direct connection to TV, and up to 20mins record time is possible for each video file.